The reverse mortgage market in the United States and the equity release mortgage market in the United Kingdom face similar challenges in today’s marketplace. Many national lenders in the United States left the reverse mortgage market last year. At their peak, Wells Fargo and Bank of America accounted for 43 percent of annual reverse mortgage originations in the United States. Bank of America cited the recession as the driving force behind its withdrawal from the reverse mortgage business. In the United Kingdom, given the changing demographic profile, and with uncertain economic conditions prevailing, there has been a slow but steady increase in lending volumes. With the equity release schemes now regulated under the Financial Services Authority (the two most popular being lifetime and home reversion plans) this should support a continued growth. Moreover, the newly badged Equity Release Council (formerly SHIP – Safe home Income Plans) is an additional safeguard for those looking at this option. 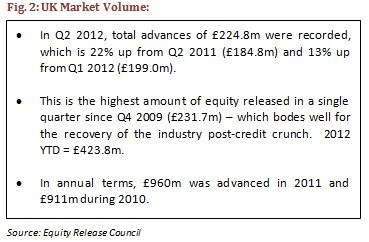 Despite a growing list of lenders within the reverse and equity release markets, the overall industry origination volume has fallen 29% from August 2011 to August 2012 (Chart 1). In contrast, there has been modest growth in new lending in the United Kingdom (Fig. 2). Although there is a rise in the number of borrowers who receive reverse mortgage counseling (generally the first stage of loan application process), the number of borrowers who actually close on a reverse loan is declining. The increasing growth in “fall through” rate between counseling and loan close further indicates the US market has yet to stabilize. As noted above, this is unlike the United Kingdom where the volume of equity release mortgages is seeing a gradual increase. The origination process is essentially the same in both countries; however, in the UK there is no insurance guarantee as there is in the States. In contrast, with a United Kingdom SHIP plan, there is “no negative equity guarantees”, or NNEG, where the lender is liable for any shortfall at exit and the right to remain in your home for life is guaranteed. Depressed home values have diminished the number of applicants who have sufficient home equity to be eligible for the loans. Collateral values in both the United States and United Kingdom have suffered since the beginning of the credit crisis. Although some improvement can be noted, uncertainty in future collateral values still exist, which is preventing rebound in these markets. 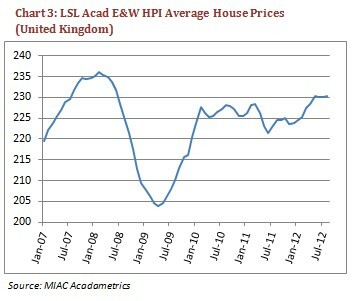 Whether within the United States or the United Kingdom, there is significant variation in the movement of house prices, thereby reducing the level of equity available to be drawn upon. Of course, other key factors impact equity levels such as, time in property, type of property and changing local environments. The reverse mortgage market in the United States can be divided into two main segments: FHA-Insured and Jumbo Non-Insured. 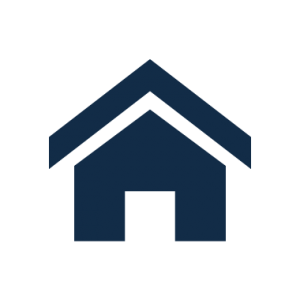 Insured reverse mortgages are guaranteed by the Federal Housing Administration. There are strict rules and regulations associated with the origination and servicing of insured loans that must be met in order to perfect the FHA guarantee. Some FHA insured reverse mortgages may be Ginnie Mae Home Equity Conversion Mortgage securities (HMBS) eligible. It is important to note that not all FHA insured loans are HMBS eligible. There are strict guidelines for originators that wish to make a loan HMBS eligible. Among other requirements, HMBS eligible loans must be originated by a Ginnie Mae approved lender. This is important to note, since the secondary market’s primary focus is on loans that fall within the HMBS segment. The investor demand within the HMBS market is positioning this product closer to more traditional investment performance. This in turn results in improved pricing for originators and borrowers, which of course makes the product more desirable to borrowers. There is secondary market demand for non-HMBS eligible FHA insured, loans, but not to the level as currently being seen with HMBS eligible loans. Reverse mortgages that do not possess a FHA guarantee have little secondary market demand at this time. As a result, there are few if any originators active within this market. Equity release mortgages within the United Kingdom, as noted, should adhere to SHIP (Safe Home Income Plans) standards. The Equity Release Council exists to ensure equity release products are safe and reliable for consumers. This Counsil sets the Code of Conduct, standards and principles for originating members. Through this council, members are able to guarantee their customers products conforming to industry best practices, further ensuring that customers are fully informed and protected. Although a government guarantee does not exist for equity release mortgages like FHA-insured loans in the US, UK lenders failing to meet SHIP standards have virtually no secondary market or investor demand. Regulation by the Financial Services Authority (FSA) of these loans now means greater focus on the lender, greater consumer security and for the markets a likely impact on the value and ability of these assets to trade. Since these loans do not have traditional repayment methods, applying accurate cash flow logic via curves, behaviors, and event triggers is a key component within the valuation process. The first stage in the modeling process should be to determine the loan product type for each loan within the portfolio. Although loans generally behave similarly between the product types, there are differences that will result in significant impact on the valuation. FHA insured loans have a Max Claim Limit, which is generally tied to collateral value. Loans can be immediately assigned to the FHA for full repayment once the loan reaches 98 percent of the Max Claim Limit. Modeling the future relationship of the current balance and the Max Claim Limit is critical, as this will have a significant impact to loan behavior and overall valuation. Due to the FHA guarantee, the secondary market applies a yield or discount rate which is significantly less than non-FHA insured loans. The performance status is more than just performing and non-performing. There are sub-performance statuses that have impact on how the secondary market views loan quality. Sub-performance statuses indicate whether the borrower has failed to make property tax payments, maintain property insurance, or properly maintain or repair the collateral. Although failing to meet any of these standards is a cause for the loan to be in technical default, most lenders will not initiate foreclosure action. However, the valuation on sub-performing loans is negatively impacted by increased yields due to these uncertainties. 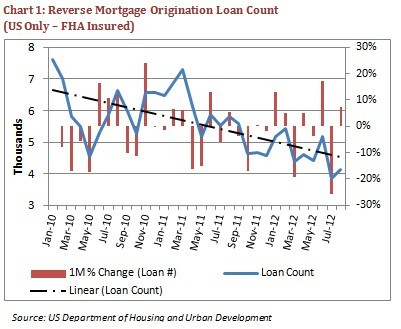 Non-FHA insured loans have the lowest valuation. The lack of FHA guarantee leaves little investor interest. The yields or discount rates are increased significantly do to this limited number of buyers within this market segment. The primary cash flow projection analysis with MIAC’s valuation model is driven by curves. There are three curves that are implemented within our modeling process: borrower draw rates, voluntary and involuntary prepayment. Ideally, historical data should be used to develop these curves. In some cases, historical files are not available. MIAC uses a variety of methods in order to obtain the data for the curves. We call this process triangulation. MIAC has extensive discussions with market participants, including originators, servicers and investors, to obtain as much market knowledge as possible. Secondly, we pull from a variety of publically available documents and data. Finally, we have access to proprietary data, which can be matched to the loan characteristics of the loan portfolio being valued. There are five draw strategies that can be chosen by the borrower at the time of the loan closing. Although each draw strategy has its own unique characteristics, the historical data we’ve analyzed all fall within a reverse bell shaped curve. This can be explained by the fact that many borrowers draw needed funds at origination and then do not require additional funds until later stages in life. Line of Credit: Draws are structured similarly to a line of credit, giving the borrower flexibility to draw the amount that is need when needed. Tenure: Draw period for the remaining life of the borrower in a fixed amount. Modified Term: Term draw structure with a line of credit component. 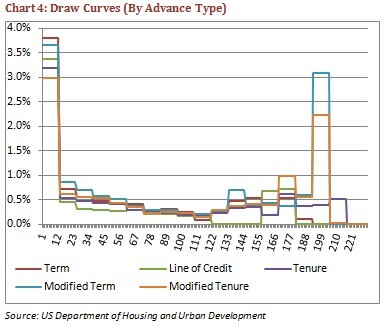 Modified Tenure: Tenure draw structure with a line of credit component. The historical data indicates that there is very little voluntary prepayment within the reverse mortgage market. A majority of repayments are associated with the borrower’s mortality. This is primarily based on life expectancy tables. This curve gradually increases as the age of the borrower increases. Involuntary curves are bell shaped. The total percentage of defaults reaches a peak of less than 5 percent when the borrower reaches the age range of 88 to 90. This curve then quickly declines thereafter. The reason for the rise is the increased costs to maintain the home and the probability that the borrower has exhausted available draws. The decline after age 90 is due to the increased likelihood of repayment via borrower death. Although prepayment and default are primarily curve driven, it is important to implement what we call event triggers. Certain events can cause a trigger at different points during the cash flow projection. A calculation is required for each month of the projected cash flow to determine if an event trigger is initiated. MIAC primarily uses three event triggers within our model: FHA assignment, Death and Maturity. FHA Assignment: As described above, the cash flow projection must include a calculation to determine if a loan can be assigned to the FHA. Death: MIAC uses life expectancy tables to determine what projected death ages are appropriate for the borrower. This ensures that the cash flow does not run indefinitely, which would skew the overall valuation. Maturity: This event trigger is rarely indicated since most reverse mortgage have 40-year terms. 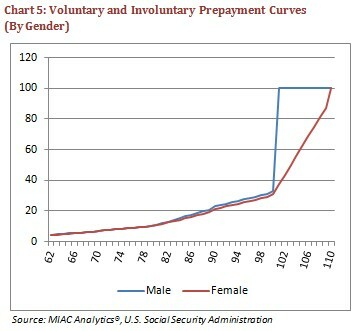 Prepayment, default or death occurs far in advance of maturity in most cases. The amount of time it takes to complete a foreclosure and liquidation process should be determined by the limitations associated with the location of the collateral. In the United States, judicial states will take more time to foreclose compared to deed-in-trust states. The United Kingdom has foreclosure limitations which may delay the lender’s ability to complete foreclosure. These timelines need to be implemented within the cash flow forecast in order to properly model behavior. The main cause of default is the death of the borrower. Many lenders allow the beneficiaries additional estate planning time to liquidate or pay off the loan before the foreclosure process begins. Each lender determines the amount of additional estate planning time, but our experience has indicated an additional 12 months is common prior to the commencement of foreclosure. The United Kingdom approaches their modeling process in a slightly different way. The primary downside risk, and therefore the core driver in the price of UK lifetime mortgages, is the value of the ‘No Negative Equity Guarantee’ (NNEG). This is the exposure to the lender of negative equity losses upon involuntary prepayment (death or long term care). There is no real concept of ‘default’ in the UK market and number 1 on the SHIP code of conduct states “allow customers to remain in their property for life provided the property remains their main residence”. Due to the number of future variables and their infinite simultaneous paths, these mortgages are often modeled using quantitative simulation based techniques. Mortality, house prices and interest rates are simulated in to the future based on underlying assumptions to understand the distribution of outcomes possible. This method enables the calculation of an expected valuation (most likely) as well as an understanding of the full range of prices across a probability distribution. The marketplace for both reverse and equity release mortgages are in transition. Understanding their respective market dynamics is key to accurately valuing them. It is equally important to fully understand the loan type and the overall status of the loans valued. 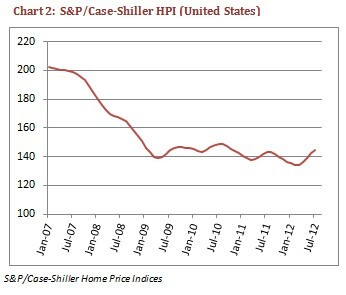 Proper implementation of the investor’s specific portfolio history is most desirable within the United States market. However, if historical data is not available, or less applicable as in the United Kingdom context, then applying appropriate behavioral and collateral assumptions and simulating them within the modeling process is critical in order to derive a valuation that holds up to market scrutiny. Whether you need to benchmark your loss provisions or have a third party valuation, MIAC and MIAC Acadametrics have the expertise to assist you with your reverse or equity release mortgage portfolios.